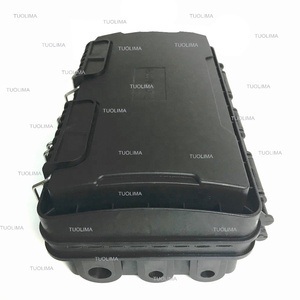 These products are made of high quality ABS material and with mechanical sealing structure filled with the sealing material. It can be reopened and reused without changing. Specification: Fiber optical cable diameter(mm) &phi;7~&phi;22 Max in and out cable No. 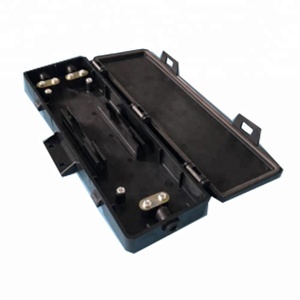 Product FTTH FOSC Fiber Optic Splice Closure/connector case 2 inlets/outlets Detailed Images Feature &bull; Standard size, light weight and reasonable structure &bull; Splice tray inside changeable &bull; Can be used in 19'', 23'' standard distribution frame &bull; Suitable for ribbon and single fiber &bull; Various panel plate to fit different adapter interface &bull; Front mark on the plate is easy for identification and operation &bull; 24C, 36C, 48C, 72C optional, with or without fiber optic pigtails and adapters &bull; Easy for management and operation Specifications product name fiber optic junction box gross weight 5kg materail ABS+PC tenlish strenght &gt;1000N The environment temperature -40~60 The atmospheric pressure 70~106KPA Tensile lift &gt;1000N Resistance to pressure &gt;2000N/10CM Compressive strength &gt;2*104MG Applications 1.The advanced core to core fiber profile alignment system(PAS) 2.Friendly smart GUI 3.X/Y axes were displayed meanwhile, Magnification up to 304 times 4.8 Sec. tube-heat time 5.Hig High-resolution true color 5.7 inch LCD display 6.Four display modes, fiber core visible 7.Store 4000 groups of splice results 8.Four display modes, fiber core visible 9.USB interface - for updates + result transfers 10.Built-in high capacity battery, support 300 times splicing and heating, to meet one days&rsquo; work 11.Long Electrode Lifetime, up to 4000 times 12.Three Splicing modes: auto, half-auto, manual 13.Close shield splice automatically, Close heater lid heat automatically 14.One year Warranty Packing & Delivery Other ways Tel: +86178552646859&#65288;Whatsapp&#65289; Wechat: CSW19961013 If you have any query, please click below. Best service and best factory price is wating for you. Foclink supply different ports types, fittings and different fiber optic core numbers for horizontal fiber optic splice closures. 8. 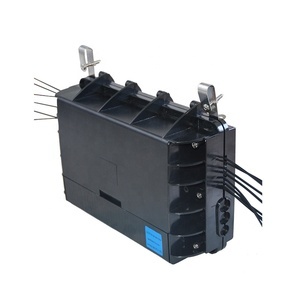 With the function of reuse and capacity expansion for many times With the function of electric connection and disconnection for electrical for the fiber optic cables. Research Department With our separate research team,so we are albe to have products made according to your requirements. 3). 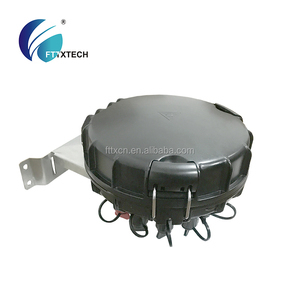 Our main products for FTTX include fiber optic patch panels, fiber optic distribution boxes, fiber optic splicing closures, PON boxes, street cabinets, patch cords/pigtails. We can offer a discount depending on the quantity. (2). Other services depend on customers&rsquo; requirements. 2.What&rsquo;s the lead time for all the goods that I required9 ---About the 3-4 working days after getting payment. 3.What&rsquo;s the warranty for your products9 ---Normally it is 2 years. 4.What&rsquo;s your payment term9 ---It is 100% T/T in advance 5.What&rsquo;s the MOQ for your products9 ---1pcs is okay. 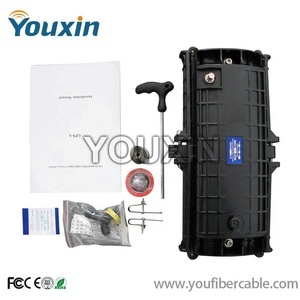 Alibaba.com offers 4,299 ftth splice closure products. About 98% of these are fiber optic equipment, 1% are other telecommunications products, and 1% are hair extension. A wide variety of ftth splice closure options are available to you, such as free samples, paid samples. There are 4,308 ftth splice closure suppliers, mainly located in Asia. The top supplying countries are China (Mainland), Poland, and Armenia, which supply 99%, 1%, and 1% of ftth splice closure respectively. Ftth splice closure products are most popular in South America, Eastern Europe, and Western Europe. You can ensure product safety by selecting from certified suppliers, including 1,383 with ISO9001, 243 with ISO14001, and 223 with OHSAS18001 certification.